The fourth day we were in Quezon City, Philippines, Janne and I decided to visit SM North EDSA. However, on our way there, I got curious on what seemed to be a new building to our left. Our taxi driver informed us that it was the newest mall in the area. Since I wanted to check it out (to feed my shopping curiosity ), I asked our driver to take us there instead. 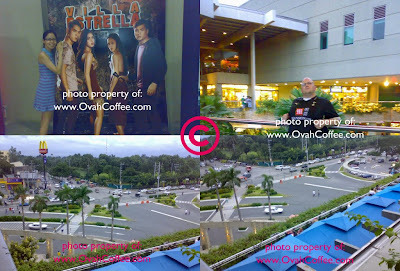 The mall which the taxi driver has been referring to is TriNoMa (short for Triangle North of Manila). Owned by Ayala Land Inc., the mall is located in Epifanio de los Santos Ave (EDSA), corner North Avenue in Quezon City, Philippines and opened sometime in 2007. TriNoMa, although not as big as SM North EDSA and SM Mall of Asia has many things to offer to its daily shoppers and visitors. It might not look gigantic outside but is actually big inside which is the reason to why it is also considered as one of the largest malls in Manila. The mall has four (4) major floors and two (2) small ones on the ground (where the supermarket and foodcourt are located). The Landmark and Crossings are two of TriNoMa's department stores and are amazingly spacious, too. The Landmark also has a supermarket and a hypermarket inside TriNoMa. My boyfriend and I tried to finish the entire mall in one day. However, because of the fact that we went inside at least every shop/boutique which was there, we ended up returning the following day and another day again to finish the entire place (yup, 3 days total). TriNoMa has 6 digital and 1 THX cinemas located on the fourth floor of the mall. Cinema tickets are priced at Php150 per person. You will also be allowed to choose which seat you will want to have so better purchase tickets as early as possible to ensure the seat number you want. The seats in TriNoMa cinemas are really comfortable. Aside from the many shops TriNoMa has, you will have a difficult time deciding on where to dine as there are lots of restaurants and food chains in every floor. 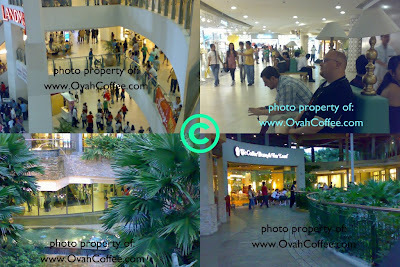 After shopping, don't forget to visit the two-level TriNoMa Park. The Park also has an array of restaurants lining around the beautifully landscaped park. TriNoMa Park's 7 water features including a reverse waterfall is also an attraction worth visiting (refer on the second to the last photo above). Parking will never be a problem to you as there are 8,000 parking slots alloted for the mall's visitors each day. Using the mall's parking area is not for free. However, parking fee is cheap as it's priced at only Php45 per day. hello skippy heart! thanks for welcoming me back here. will share more photos later! hugs! it's a cool place for real. if you have time, visit it. hugs! naku. di nako nakapagdala ng salted fish. pero, binusog ko sarili ko with salted fish sa pinas. hehe. 3 weeks sa pinas 1 week sa hong kong. saya nga eh. hehe. mwah! hello elai. hehe. sus. kung mayaman lang ako, why not? hehe.